Summary: Anna and her baby sitter/Sunday school teacher, Jericho, began the Safety Club after a series of forest fires swept across Colorado because “we’re braver when we feel prepared.” Now Anna and Jericho still meet each week to prepare for unforeseen crises like getting trapped in a pyramid or fighting Roman chariots. 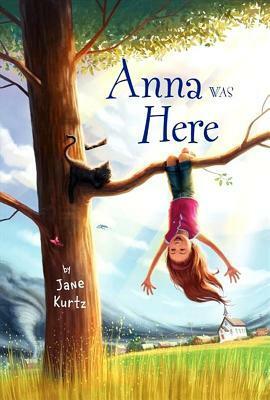 As the book begins, though, Anna encounters a crises for which there can be no preparation: her father, an associate minister, is taking a temporary call to his home church in Oakwood, Kansas “to help them over a hump.” Oakwood, where Micah Nickel, her father, grew up is inhabited mostly by his relatives who are still disagreeing with with one another about pacifisim back in World War I. They are, also, still bearing a grudge because Micah’s mother broke up the family farm when she left Oakwood. Anna must leave Jericho, her perfect green bedroom, a church and routine that she loves for flat, dry Kansas and a host of aunts and cousins, one of them very hostile, a challenging church, a new school, a pink bedroom, and tornadoes. Through all of these new experiences, Anna looks for God until her mother and little sister must return to Colorado to care for her grandmother and she is left with a father who is preoccupied with the church and she must actually start to school. She says to God, “Forget it. I’ll handle things on my own,” and runs away, but only as far as the old family farm. A cousin, Caroline, has returned to Oakwood to try farming the small acreage left. She lets Anna stay and help on the farm while she is so angry and unhappy. On the farm Anna learns about lavender honey, hens, eggs, emus, and ancestors and adds plans to her Safety Notebook about rattlesnakes and clouds. But her careful plans can’t heal the breach with her father or change her anger with God. Literary elements at work in the story. This story is told by almost ten-year old Anna with her distinctive vocabulary-sad or tragic stories are “unsavory;” possible dangers are met with“shiverydee,” “squish, squash, smoosh, splat” announces a devastating event like moving-and with striking images-”I’ll be folded up like a lawn chair while we live there.” For a book that is a continuous struggle to understand tragedies and natural disasters it is a humorous 279 pages. According to developmental psychology, Ann is a few years before the curve for theological thinking but it seems to emerge naturally for a child whose family speaks comfortably and often in the language of faith. Jane Kurtz’s parents went to Ethiopia to work with the Presbyterian church for 23 years and her husband is a minister so her words about moving and ministers’ families have experience behind them. How does the perspective on gender/race/culture/economics/ability make a difference to the story? These elements play little part in the story. Theological Conversation Partners: Natural disasters can come with horrifying reality into any living room with TV or computers and, hence, into any child’s life. Anna offers occasions to talk about these things, to voice questions about what God is doing and how these connect with God’s will. The book presents no answers but there is a sense of security in the seeking. Certainties are as great as the mysteries,says Michah Nickel and we need to name the certainties with children even while we say, “I don’t know.”(Genesis 1:31; Isaiah 43:1-4; Psalm 23; Matt. 11:28-30; Romans 8:38-39; Philippians 4:4-7,1st John 4:7-11 are some possibilities) Forgiveness is an important theme in the book. Grudges have remained alive through generations; Anna feels her father has betrayed his family; Simon, one of Anna’s cousins, tops a series of persecutions by letting her cat go just before a tornado.. How people deal or don’t deal with these situations is another fertile area for discussion.. ( The Lord’s prayer, Matt. 18: 21,22 offer guidance.) Anna mentions at least 8 Bible characters and is familiar with the Sermon on the Mount but there are no references to Scripture that she turns to in situations which she cannot control. This could be a time to for children to think of Scripture that is a source of comfort and courage. (Ps. 27, 56, Matt 28:20b., Philippians 4: 13) The question of call is raised as Anna’s father describes his call to Oakwood and Anna sees her call to keep her family safe in a different light. Jericho is a person who has had great influence on Anna. What are some of the things she has taught her? Anna says frequently that she doesn’t need any friends? Why does she feel this way? Do you think this is true? Anna’s father felt a call to Oakwood. How did he hear this call? How did Anna feel that her call contradicted her father’s? Anna hears about the death of three sisters in a snowstorm and her great grandfather finding a hog shed during a snow storm that saved his life. “Never give up hope,” says her father. “Preparation was better than hope,” thinks Anna. What do you think? What natural disasters do you fear? How do you deal with these? Not all bad things in our lives are natural disasters. What are some of these things in Anna’s life? In your life? How do you deal with these? Anna has the opportunity to get even with Simon who has caused her so much trouble. She doesn’t. Why? Simon’s grandmother takes him away for the weekend and Anna feels this is an answer to prayer. What do you think? Anna notes that “lions didn’t make personal remarks” as she listens to insulting comments directed to her cousin. Can people be as destructive as tornadoes? Mae’s definition of forgiveness is, “when someone does something bad to you and deserves something bad back, but you don’t do it?” Is this a good definition? When Anna and her father are discussing why bad things like tornadoes happen he says, “There are lots of big mysteries. There are lots of big certainties, too.” What are some of these certainties? Anna Was Here by Storypath is licensed under a Creative Commons Attribution-NonCommercial 4.0 International License. It is an awesome book. Im 11 and the book is very good.